• Power station ANT, accumulates energy when you use your generator, accumulates energy from the solar panels or you can even carry and fully recharge it from a wall outlet. • You can use the accumulated energy whenever you need it, you will enjoy hours of silent and stable 100% energy. • Rated output power 600W, startup capacity of startup peaks up to 1200W. • Integrated inverter pure sinusoidal wave output ensures electricity (230V 50HZ) highly stable in all parameters, including frequency harmonics. • Integrated high quality AGM battery, capacities available 100Ah, 150Ah and 200Ah. • 4-stage smart charger with manual load dimmer, short circuit protection, low voltage, reverse polarity and temperature. • Integrated solar charge controller manages battery charging from the panels efficiently prolonging its life. • Clear and intuitive control panel, is extremely easy to use, requires no configuration or programming. 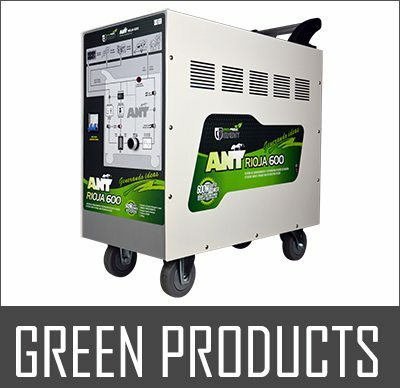 • Compatible with our solar panels “KIT SOLAR ANT 150W”. • Compatible with any type of 230V 50HZ generator either regulated by capacitor, by electric regulator or inverter process.